More Uodome and a mind-bogglingly amazing wild trout stream! I was invited to fish with a new friend I made at the last TU meeting in NYC. We were to fish a small stream. I had told him about my last adventure, and he assured me he'd outdo it. I was obviously extremely excited. The weather was definitely cooperating as well. 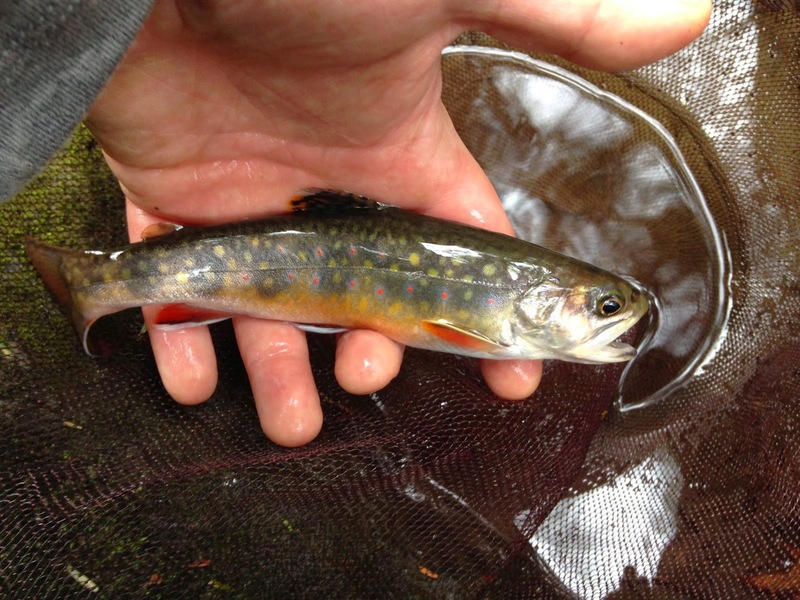 As we hiked into the stream we came upon perfect trout water and I was into some little brookies right away. It was a sign of a healthy stream. 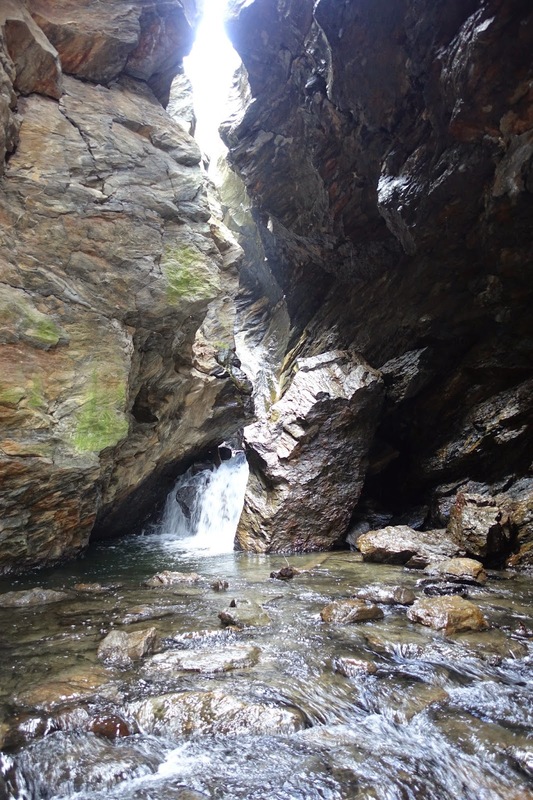 Cascading pools and a bit of a gorge forming. Hits in every pool, fish netted in most. The only brown of the day. This river was a tributary to another larger river, could some baby browns have made it up here? Also, have I mentioned how much I've been enjoying this new rod? It is taking the beating I'm giving it very, very well. Adrien had indicated we were going to a very special fishing location, but I had been too distracted by the fish to think much about it... until we came upon a cave of epic proportions. Not only was there Uodome, but the cave was a sight to behold! Talk about fishing spots... first careful cast brought a fine specimen to net. 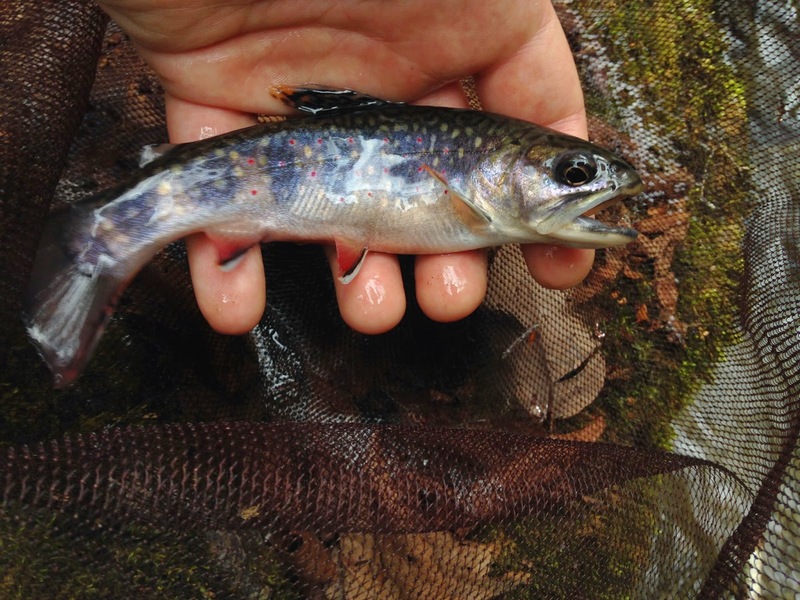 It often seems that in these small streams, where brookies don't often break the 12" mark, the trophies of each pool can be indicated not only by length, but by the size of their tails. This one is collapsed a bit in the net. It was HUGE! My day pack is a little bulky. I'm waiting for a slightly customized pack that I ordered from Chris Zimmer. Picked up another fish in the pool in front of the cave. We decided to go all out and hiked a seriously steep embankment to climb over and beyond the cave. We figured there would be some epic pools that most people didn't put the effort into reaching. On the way over there was mineral deposit art. Adrien peeks back to see if I can make it around the fallen tree. A treacherous moment. In fact there were lots of those. I wouldn't want to do this stuff alone. Too many opportunities to slip and fall. you can see the chasm above. 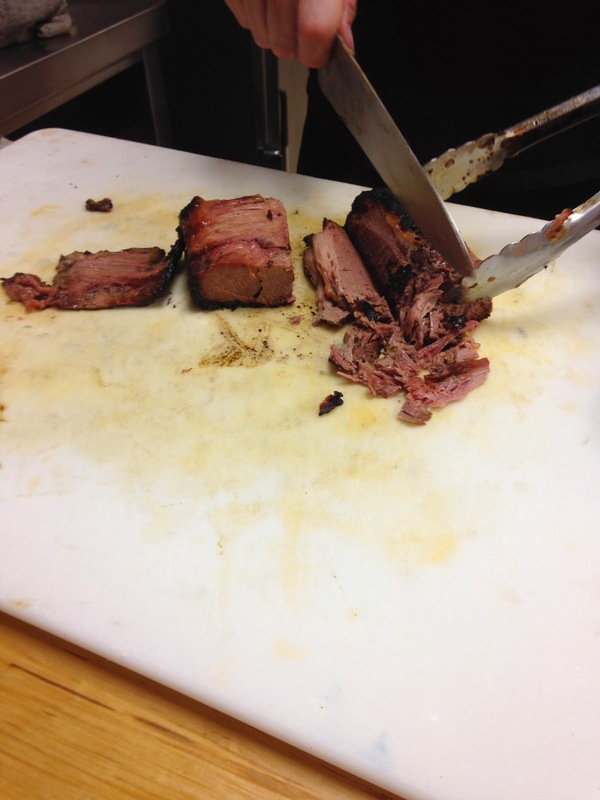 It became immediately apparent that it was worth the effort. The first pool, which was dubbed the un-fishable pool, clearly held large fish. Only way in there was a rope and harness. Best left for another time. I hooked into the largest fish of the day here in a calm spot between two rocks and next to the splashing falls. I thought it was a snag at first. I don't know how it got off, but it was probably the fact that I flattened the barb on my hooks. Above that was another overhang pool. It had nice log cover from some really large old trees that had been washed down there ages ago. I let Adrien fish these pools and climbed up ahead. One small brookie came from this little pocket in the rock. Another run under a cave produced a brookie. Beautiful scenery around every bend and over every rock formation. I got a few nice ones in this pool. ...between the rocks, and then in the center as well. Almost unbelievably, it kept going like this. Run after run, pool after pool, cliffs and caves galore. 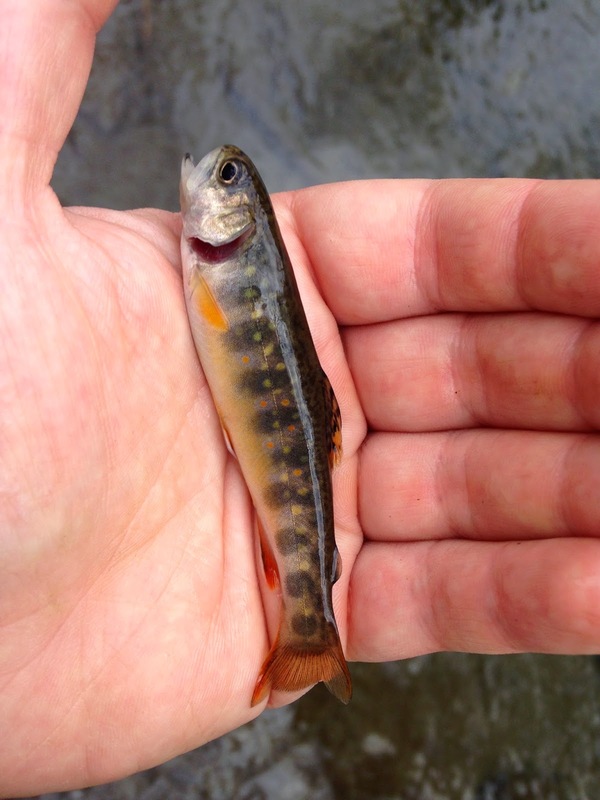 There were small brookies in pretty much every spot that I expected. I'd like to take a moment to point out that while buggers were working fine, the most productive fly of the day was again, Rich Garfield's Ausable Ugly. In this pool, Adrien caught fish on the left side - some really nice ones. I think his fish of the day came from there. I was able to fish the right side at the same time and also caught fish. Crazy! After a while the stream finally flattened out a bit and returned to a more "standard" format of pools and riffles with a plunge here and there. It was picturesque the whole way up. We had both missed fish of a decent size in this first pool and had decided to fish it again before leaving. Adrien hooked a few trout and then we took a break.We were each into over 15 fish at this point, and I had lost count around 20. Adrien is french, and showed me his french style dry flies, which present the hackle in a slightly forward manner. Its not quite as pronounced as a tenkara fly, but you can see what I'm getting at. His dry flies were beautifully tied, it was a shame we didn't get to use them this day, but the fish just weren't rising yet. The water was still in the 40's, after all. I was no purist this day, fishing bead head flies almost the entire time. I wasn't into the larger fish I had hooked earlier, likely because Adrien had taken them a moment before. I hooked a couple of fingerlings and then decided to call it a day. We stopped on the way for some BBQ since it was late and we were tired from a long day of crawling and sneaking around the stream, climbing over waterfalls and ascending and descending the various gorge areas we were fishing. All the sore muscles will be well worth it for one of the greatest days of small stream fishing I have ever seen. Thanks to my new friend Adrien for taking me to his spot! 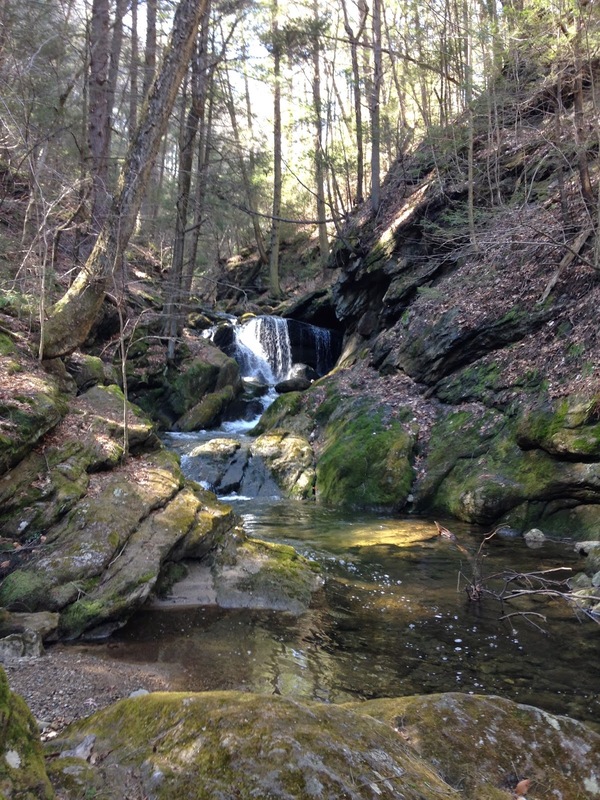 Today I fished a new section of a stream that I fished once last fall. It holds wild brook trout and some chub. 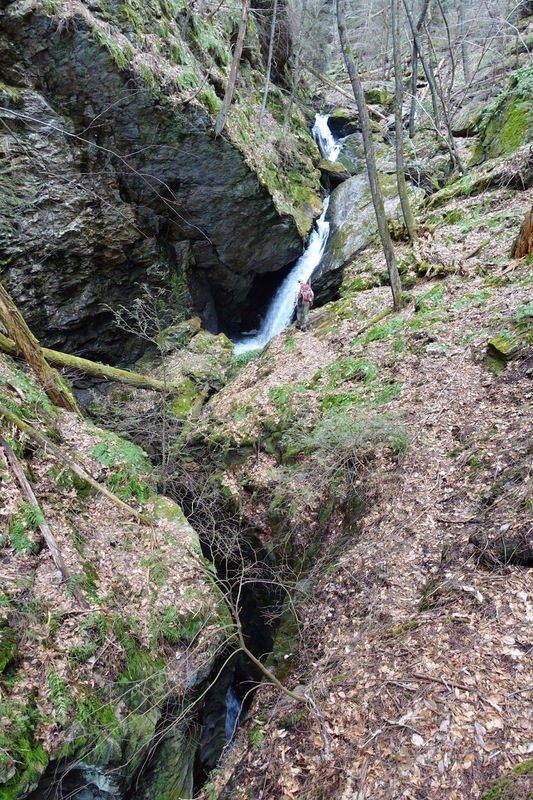 This particular stream tumbles down a mountain and through a beautiful gorge. It has riffles. Deep fast runs. Plunge pools. And Uodome, or "fish stop waterfalls" in Japanese! 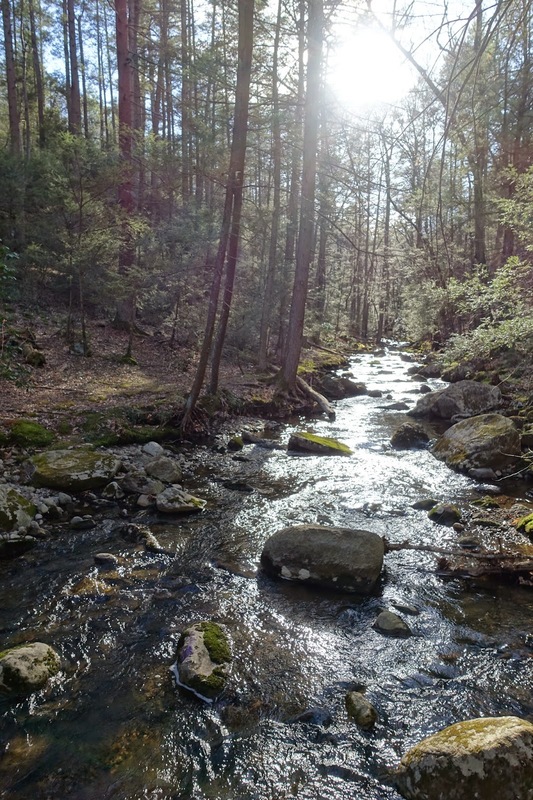 Last year, I fished the upper section of this stream as it meanders through the forest and near a road. This time I explored the gorge and got my first Sawanobori (stream/shower climbing) experience in. Fishing a few prime lower pools with an Ausable Bomber nothing rose to my fly. I got down to business and threw on an ugly and was soon into some fish. Working my way up to the first pool I started in the deep run on the left and towards the little falls. I had some small hits that I didn't set. Finally I hooked one near the top of the pool, but the fish was off before I had it in. Using no-barb hooks doesn't make it any easier. The next pool was long, curved and deeper towards the end. It definitely held fish. I extended my rod to the 3.6 meter length, tossed my fly into the white water and got a hit first cast. That was followed by a solid hook up on the second. 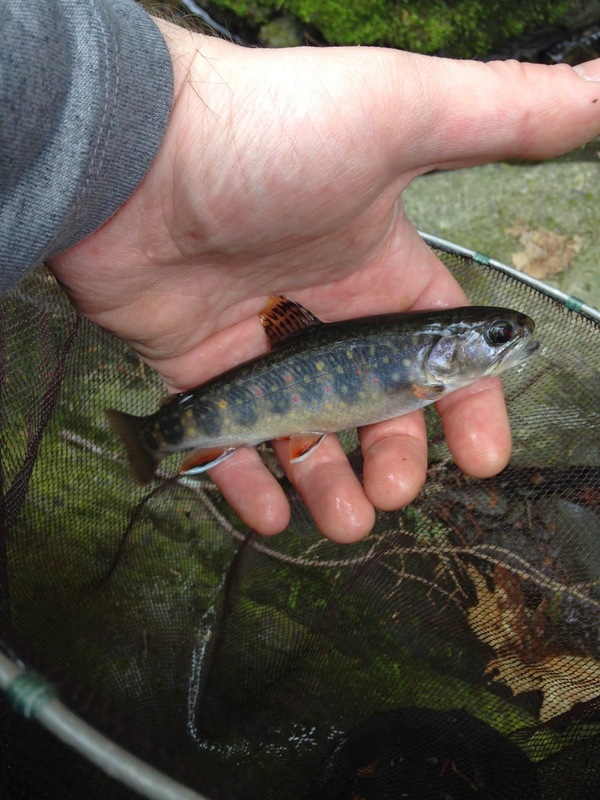 A beautiful small brookie was soon in the net. Knowing that any other fish in that hole were spooked, I moved up and saw a picture perfect pool. I navigated my way down and snuck up behind the rocks at the base of the pool. What a spot. I have really been enjoying the zoom feature on my Suikei. I started the day with the Kurenai but I just keep coming back the the Suikei for its versatility. I netted another small brookie at the 3.2 setting and then went to 3.9 to reach the base of the falls. The close range brookie was very small but had candy-like spots. The next pool was blocked by a tree and made fishing it really difficult. I netted fish nonetheless. They were small. 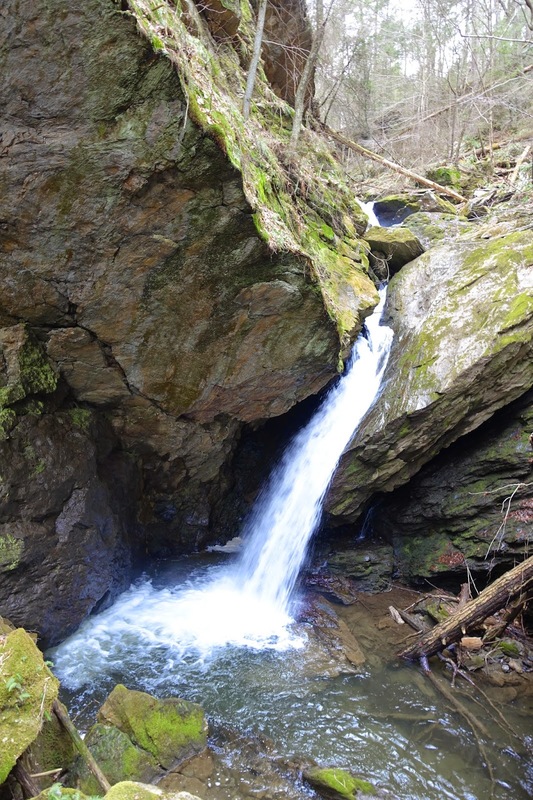 The stream tumbled down a rock face and went around a bend. Time had created a cave and it reminded me of a Dali painting for some reason. Standing in the shallows, I cast straight up and let the fly drift under the cave to the right. I hooked into a small fish and released it quickly. Casting to the left, I went for the drift under the overhanging rock. The pool was deepest there and I hooked into a sizable fish that put a good bend in the rod. As fate would have it, I did not land that fish. Up higher the stream flattened out but still had some nice deep pools. Most of them were long, oval or rectangular shaped pools that were pushed off to the sides of the stream. I wasn't getting any hits in the flatter water up at the top of the falls and the sun was warning me it was no longer early afternoon. I wanted to get back to the car and move up to where I caught fish last fall at the top of the stream. The first fish I landed up top was a little bit bigger than the plunge pool natives from below. I caught a few more working my way up towards the log jam pool I remembered so well from my previous visit. There's a real maze of branches to avoid when casting to this epic pool. Its easy to spook fish here, the flat water to the left is placid. I was in luck today. Maybe because I lost my larger fish down in the gorge, but I couldn't have been more psyched when I hooked an absolute stunner of a wild brookie. It was a real paddle-tail. A king of this upper section of stream, with a rather unique sea-green hue that I don't often see in these fish. The fins were strong and beautifully colored with orange like a monarch butterfly. I took a moment to get a good look at this fish before releasing it. Clearly one of the most beautiful brookies I've caught to date, and by far the best day I've had so far this year. Looking forward to exploring a new stream with a new friend tomorrow. Until then, goodnight!